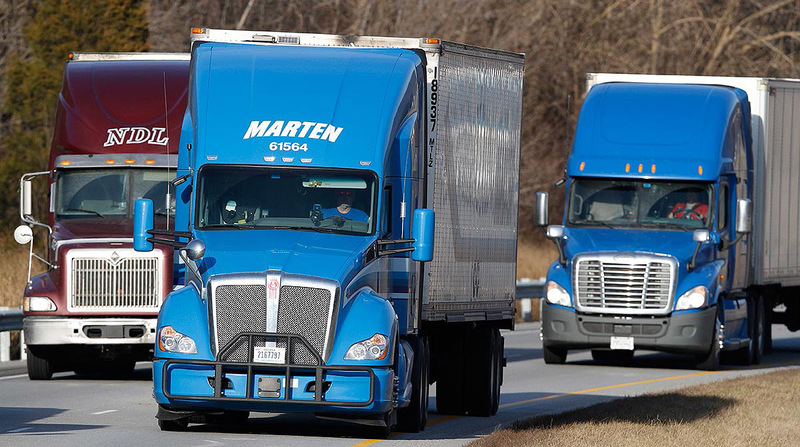 Marten Transport announced that profits rose 7.2% in the second quarter, easily beating the forecast from industry analysts and shifting the momentum after J.B. Hunt Transport Services’ disappointing results on July 17. Mondovi, Wis.-based Marten earned $9.1 million in profit, or 16 cents per share, for the three-month period ending June 30, 2017. The Bloomberg News consensus forecast of industry analysts called for $7.7 million. One year ago, the figures were $8.5 million or 16 cents per share. Revenue improved 3.3% year-over-year to $171.5 million. “We are encouraged by our growth in revenue and profitability, driven by our continued disciplined execution of Marten’s unique multifaceted business model. Excluding the one-time facility disposition gain in our first quarter of 2015, we earned the highest net income in our history in this quarter and achieved our best operating ratio, net of fuel surcharges, over the last 10 quarters,” Chairman and CEO Randolph Marten said. Truckload revenue eked out a 0.9% gain to $94.9 million but due only to a 17% jump in fuel surcharges. Excluding fuel, revenue dropped 0.7% to $84.5 million. Operating income grew 8.1% to $7.5 million. The average miles per trip dropped to 589 miles from 625, and total miles driven fell to 45.7 million from 46.3 million one year ago. Dedicated contract carriage revenue improved 5.7% to $41.5 million, but operating income declined 1.2% to $5.1 million. The average miles per haul dropped 10 miles to 292, but total miles rose to 19.4 million from 19 million last year. Intermodal-drayage revenue went up 7.5% to $19.1 million, and operating income increased 12% to $2 million due to a 12% increase in loads to 9,793. Revenue at the freight brokerage unit grew 6.6% to $16 million, and operating income was up 8.6% to $944,000 due to a 1.3% increase in loads to 11,578. In the first six months of the year, Marten’s revenue grew 5% to $344.7 million and profits improved 3.8% to $17.4 million compared with 2016. Operating income is down 2.9% to $13.5 million in truckload but up 1.1% to $9.6 million in dedicated, 12% to $4.2 million in intermodal and 26% to $2.3 million in brokerage. Marten ranks No. 46 on the Transport Topics Top 100 list of the largest North American for-hire carriers.